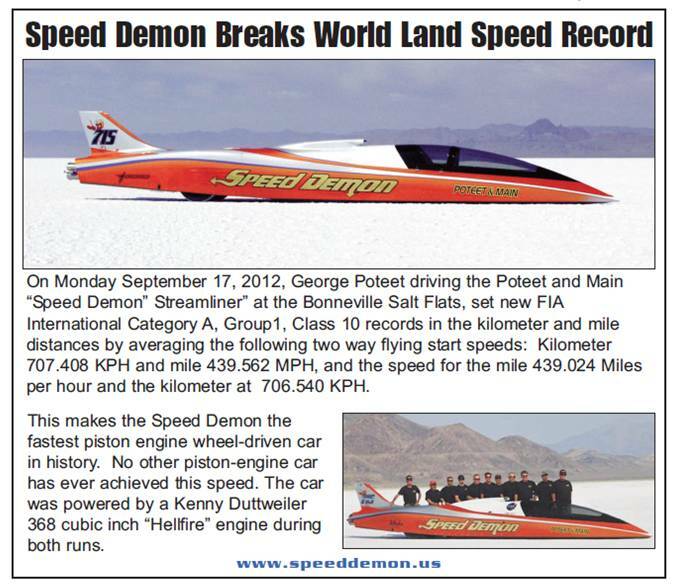 On Monday September 17, 2012, George Poteet, driving the Poteet and Main “Speed Demon” Streamliner, at the Mike Cook Shootout at the Bonneville Salt flats in Utah, set a new FIA International Category A, Group1, Class 10 records in the kilometer and mile distances by averaging the following two way flying start speeds. Kilometer 707.408 KPH and mile 439.562 MPH, and the speed for the mile 439.024 Miles per hour and the kilometer at 706.540 KPH. This makes the Speed Demon the fastest piston engine wheel-driven car in history. No other piston-engine car has ever achieved this speed. 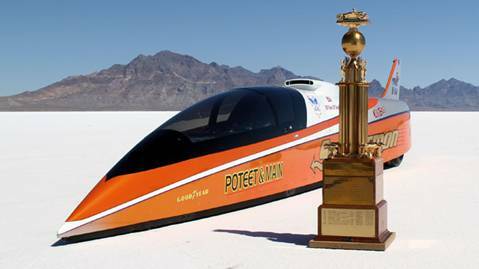 Poteet & Main Speed Demon has won the Top Speed Trophy for the last 4 consecutive years. Every year that Speed Week has been run since 1949, HOT ROD magazine has issued the Top Time Trophy, the award for the single fastest pass of the meet, regardless of if the pass is a record or not. To many, this is the ultimate prize for Speed Week. I was looking in the cockpit in impound Speedweek 2011 and noticed the speed sheet on the seat . That was a photo opportunity, but the crew member i asked was worried that i might run off with it. well i said " you will have my camera in hand " and now i have a photo holding it in front of me with the 408 mph speed . One of the main things you take away after seeing speed demon is how "quiet it is "at speed . Last edited by 1 on penny, edited 0 times in total. This is a forum post on Landracing.com, compiled by dean of Los Angeles .You will notice that on the 16th of sept he made 3 runs that day. The nature of the event is return runs , which means he turns around , carries out vehicle checks has a nervous wee and returns back down the course ,and in doing so rolled back into his pit . One COOL dude. To put this is some kind of context ," more people have walked on the MOON than have been over 400mph"
The last Speed Demon run was the 26th over 400. Stupendous. Here are the 25 runs I could find. Sept 15 8:21 Speed Demon Entry 432.99 Kilo 436.35 Mile 436.17 Exit 438.83 A-1-9 3-5 liter Class 9 299 ci “D” Record 363 No return run. Hole in head. Sept 17 8:58 Speed Demon Entry 444.0 Kilo 449.32 Mile 449.16 Exit 453.8 A-1-10 5-8 liter Class 10 362 ci “C” Record 405 Down run. 715 C BFS Poteet & Main "Speed Demon" 313.949 333.033 376.028 408.460 421.009 HOT STUFF RUN !!!!!!!! 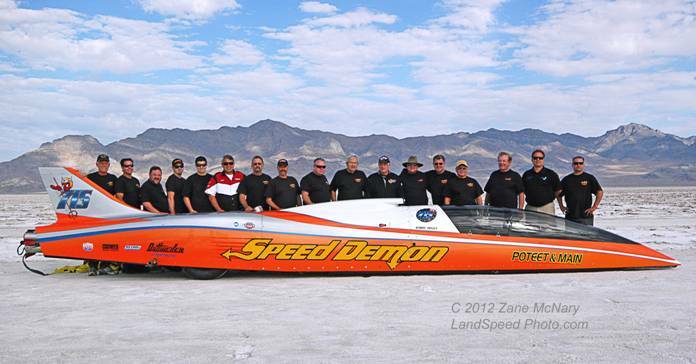 That is one great Team and one amazing Streamliner. 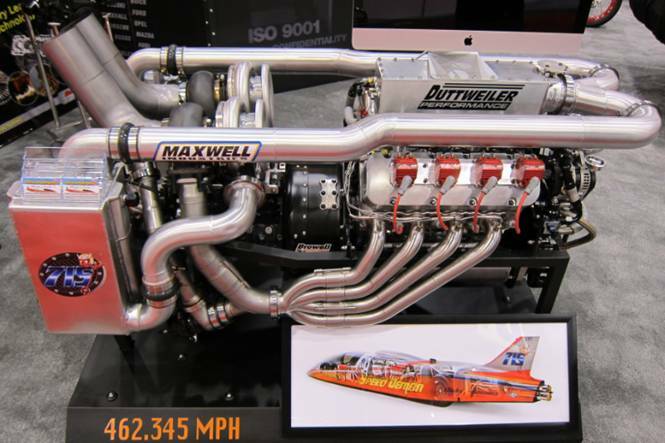 It shows how Land Speed Racing just keeps on evolving. We just downed tools while we were getting ready for a run to hot foot it to the viewing area .